A solar flare is an intense burst of energy released at the surface of the Sun. It is caused by a process known as magnetic reconnection. The rotation of the Sun occurs at different rates depending on latitude. It has a rotational period of about 25 days at its equator, but about 34 days near the poles. This means the equatorial regions of the Sun rotate faster than the polar regions. Because of this differential rotation, the magnetic field of the Sun is twisted, so that over time the field lines of the magnetic field gradually wrap around the Sun. You can visualize a magnetic field by thinking of field lines running from the North pole to the South pole. For the Earth’s magnetic field, the lines basically run from North to South, similar to longitude lines. The Sun’s magnetic field lines might start in a similar shape, but because the equator rotates faster than the poles, the lines twist around the Sun near the equator. But the magnetic field lines would like to simply run North to South. So when they are twisted tighter and tighter around the equator region, they reach a point where they snap back into place, which is known as magnetic reconnection. When this happens a great deal of energy is released, causing a solar flare. Solar flares are categorized by how intense they are at a specific x-ray frequency. The most intense category is known as an x-class solar flare. The smaller classes are further broken into a linear scale from 1 to 9. Since the x-class is an open class, its number ranking is a doubling scale, so that X3 is twice as powerful as X2. Some recent solar flares ranged from from X1.7 to X3.2. 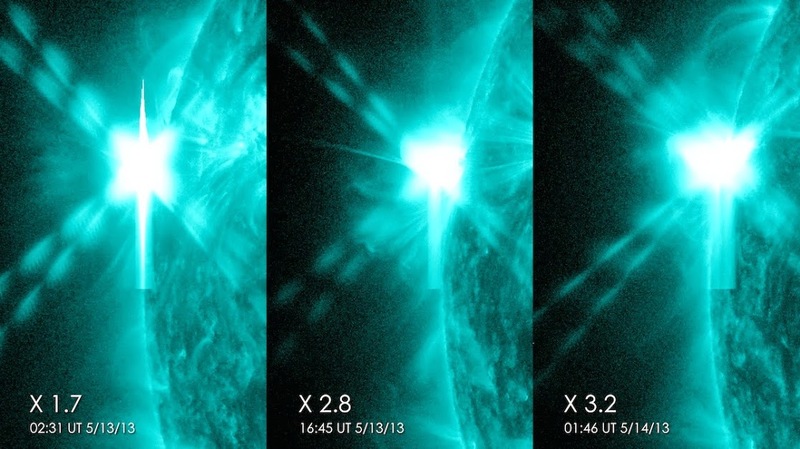 While it is a bit unusual to see many x-class flares in rapid succession, flares of this size are completely normal during the Sun’s active period. While flares of this size can have an impact on satellites, the only impact for most people is a glimpse of northern lights if we happen to be at the right latitude. Intense solar flares can have larger effects on us, such as causing power outages. 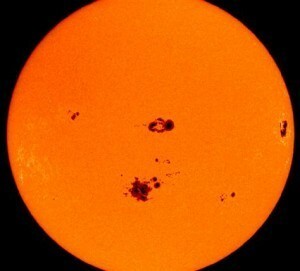 In 1989 an X15 solar flare triggered a regional blackout in Quebec. So when solar flares hit the news there are the range of websites predicting the dreaded “big one”. Theses sites often reference the “Carrington Event” of 1859, which was so intense it produced northern lights as far south as the Caribbean. It also induced currents in telegraph lines. The storm induced enough current in the lines that messages could be sent across them even while the lines were disconnected from their power supplies. Still, if you want to keep tabs on the Sun’s flare activity, check out the space weather website.